The west coast of Australia is home to some truly beautiful places and the journey from Perth to Broome will expose you to some of the best of these. A 14-day trek along this spectacular piece of coastline is an ideal way to spend a 4WD holiday and will open your eyes to be magnificence of this country�s western state. Your journey will begin in Perth, Western Australia�s capital city, and a great place to start preparation for your journey. Heading north will take you to the towns of Geraldton, Kalbarri, Denham and Carnarvon, lovely coastal settlements with idyllic beaches and natural attractions. Exmouth, Onslow and Roebourne are also sure to be coastal highlights, before you head inland to some of the state�s most remarkable National Parks and outback areas. Once finishing your inland adventure you will eventually head to the famous Eighty Mile Beach, which will create a great destination to stay before you wrap up your trip in the city of Broome. Positioned on the banks of the graceful Swan River, Perth is the capital of Western Australia and is a city with a difference. Just 20 kilometres inland from the Indian Ocean, Perth is a fantastic place to begin a 4WD adventure of the west coast. Offering everything a metropolis should, this city combines comfort with style, nature with progress and fun with adventure. Take a long relaxing walk along the river�s edge, dine in one of the modern restaurants and cafes, or take the short ferry trip over to Rottnest Island where you will find a tranquil setting, bursting with flora and fauna and some of the most beautiful seaside sights around. Spoil yourself a little on the first night of your adventure by staying at the Perth Discovery Holiday Park. Nestled in beautiful landscaped gardens, this park offers the quintessential Perth experience, along with all the modern facilities you and your 4WD camper could need. Relax in the swimming pool and fire up a BBQ by the water�s edge, all while enjoying the peace and quiet of this laid back tourist park. Even though this adventure is sure to expose you to much of Australia�s wildlife, the zoo is still worth a visit to experience the diversity of the animal kingdom. Visit Africa, Asia, South America and Australia all in one and encounter animals like the hyena, Galapagos Tortoise, Rhinoceros and the Zebra. Definitely an attraction for the kids, the Perth Zoo is sure to be fun for all. Regarded as the gateway to the pristine Abrolhos Islands, Geraldton is a lovely seaside town, superbly positioned on one of the most spectacular stretches of coast in the state. Home to a multitude of natural wonders and attractions, Geraldton is a favourite with tourists and offers something for all ages. Whether it�s history and heritage, the beach lifestyle or culture and shopping you are after, this destination has it all. While most prefer to take the coastal route, a popular alternative for 4WDers will take you inland past stunning nature reserves, quaint picnic and miner�s areas and to gorgeous rock pools, which provide perfect chances to cool off. If you decide to take the inland route be sure to stop in at the Coalseam Conservation Park, the Depot Hill Nature Reserve and Ellendale Pool. Situated on the Bativa Coast, just 10 kilometres north of the township of Geraldton, Drummond Cove Holiday Park is an ideal family park and offers some great sites for you and your 4WD camper. Positioned within walking distance to some of the area�s best beaches, this is an ideal place to stay to enjoy a seaside lifestyle. This is a great place to stay for those who can�t seem to get enough of the 4WDing experience. Although the actual caravan park doesn�t offer top class facilities, its easy access to some fantastic 4WD tracks is undoubtedly its draw card. The coastal tracks are great for beach 4WDing (without actually going on the beach) and will lead you to some fantastic fishing spots. Lying just off the coast of Geraldton, the Bativa Shipwreck is one of Western Australia�s best known historic dive sites. Take a dive tour and you will discover the fascinating history of this Dutch ship that crashed here in 1629. Suitable for all levels of divers, this is a wreck you will want to see more of. Easily one of Australia�s most untouched group�s of Islands, the Abrolhos Islands stretch for over 100 kilometres just off the state�s mid north coast. Offering some of the best fishing in the world, these islands are well worth some exploration, if only for their dazzling beauty. Kalbarri is situated on the sandy shoreline of the Murchison Rover, along with some gorgeous bays and beaches. Home to some glorious natural attractions, the highlight of the area is no doubt the Kalbarri National Park, which offers spectacular views of the gorges, the river and some of the state�s best hiking tracks. Kalbarri is also close by to other famous attractions including Monkey Mia, Shark Bay and Ningaloo Reef, giving you the option to base yourself here and venture a little further to discover these truly incredible attractions. Enjoy magnificent panoramic views of the Murchison River when you stay at Anchorage Caravan Park. Facilities include a large swimming pool, well equipped camp kitchen, kid�s playground and a close proximity to boat ramps and other fantastic outdoor activities. Whether it�s fishing, whale watching or dolphin spotting you�re after, one of the Reefwalker Adventure Tours is sure to satisfy your wants. Share in the wonder and excitement of spotting the most fascinating creatures of the sea of drop a line and catch a tasty dinner. Discover what all the fuss is about the Murchison River when you embark on one of the Kalbarri Wilderness Cruises. Discover this fascinating natural environment as you take a trip up the river, through untouched wilderness and past unique and intriguing wildlife. This is the perfect way to discover Kalbarri and will allow you to recognise what makes this region so magical. Known as the most westerly town in all of Australia, Denham is positioned on the Peron Peninsula and is a lovely port town, famous for its prawns. The area is perfect for 4WDing, as its peninsula position gives it an edge that you won�t be able to resist exploring. The Francois Peron National Park is situated just up the road and a 4WD is an essential for entry. The wilderness here is truly remarkable, offering sights that will no doubt take your breath away. Shark Bay is also nearby and is guaranteed to please. This world heritage area is full of tranquil lagoons and of course, the creatures that have given the area its name. Degree of Difficulty: Difficult from Useless Loop Road turn-off to Steep Point and return, otherwise easy. Discover the best of Denham, Monkey Mia and Shark Bay when you stay at the Denham Seaside Tourist Village. Located right on the water�s edge of Shark Bay this lovely holiday park offers a large amount of camping sites and modern facilities to meet every visitor�s needs. Perfect for those wishing to fish, play with the dolphins at Monkey Mia or simply relax by the water, this park will be a hit for all. As one of the world�s premier natural dolphin sighting areas, Monkey Mia never fails to disappoint when it comes to capturing a glimpse of these clever creatures. This world heritage landmark is a popular escape for visitors seeking a nature experience like none other. This attraction is a series of tranquil lagoons located just outside Denham. Hire a canoe and explore the lagoons is a more interactive manner, encountering fascinating wildlife, exquisite fauna and breath-taking sights. 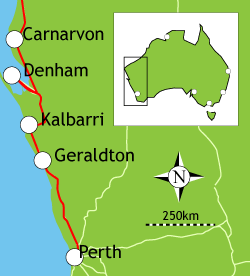 Carnarvon is one of Western Australia�s best keep secrets, and with good reason. This tropical oasis is commonly recognised for its banana plantations, tropical fruits, seafood and warm climate, but it also offers so much more. Carnarvon is an ideal place to stop for a night simply because there is just so much around it to see and do. Whether it be getting out in nature, relaxing with a good book or venturing out in your 4WD, Carnarvon offers the perfect climate and atmosphere for everything. Situated just 8 kilometres north of Carnarvon, the Rocky Pool campground is an ideal place to stay for those seeking a little peace, quiet, serenity and a touch of isolation. Camp right by the edge of this Gascoyne River pool and enjoy the opportunity to take a cool, refreshing dip and absorb the abundance of bird life. The Coral Coast Tourist Park is positioned right in the heart of Carnarvon, making it an ideal base for exploration of this intriguing region. Nestled under the shade of lovely old trees, the park is well maintained and offers modern facilities to accommodate your every need. Although it�s located a good two-hour drive out of Carnarvon, the Kennedy Range National Park is definitely worth the drive. Perfect for a 4WD adventure, the park is characterized by its red rock landscape, stunning gorges and incredible cliff faces. Red sand dunes, Spinifex, wattle and mallee trees are also scattered throughout the park, making for an experience of this region full of nature and wonder. Famous for being the home of the Ningaloo Reef, Exmouth is a gorgeous seaside town that offers a wealth of things to see and do on any kind of holiday. Situated on the North West Cape in Western Australia, Exmouth is best known for offering the �Range to Reef� experience, thanks to its two major draw cards. While the town is extremely remote, it is a fantastic place to base yourself for the exploration of these two amazing natural wonders. This caravan park is situated 17 kilometres out of town, right on the tip of the North West Cape. Close to a surf beach and boat launching facilities, and only a stone�s throw away from the reef and the ranges, this is an ideal park to base yourself for exploration of Exmouth. Apart from Queensland�s Great Barrier Reef, Ningaloo Reef is Australia�s most famous. The fact that it has remained virtually untouched it perhaps its most prized possession and is essentially what draws so many tourists to it each year. Walk from the beach right into the coral reef and you will discover more than 500 species of tropical fish and 220 species of coral. Perfect for snorkeling, this is one natural wonder you will not want to miss out on. Located on the west side of the North West Cape, the Cape Range National Park is home to spectacular rugged cliffs, breathtaking deep canyons and over 50 kilometres of untouched beaches. Spend time discovering some of the 700 caves throughout the park and trek through the wilderness in your 4WD, all while experiencing a glorious wilderness of colour and intrigue. Onslow may be small but it is still worth the trip. This is a town that has over the years been devastated by natural disasters but has still managed to stay strong. The highlight of the area is without a doubt the Ashburton River, which is buzzing with wildlife and offers the option to camp on its banks. Three and Five Mile Pools are also well worth a look, while the Ian Blair Memorial Boardwalk is also a popular attraction in town. Situated right on the beach, this caravan park is the perfect place to stay while visiting Onslow. Enjoy a laid back atmosphere and family-friendly attitude as you set up camp beneath a shady tree and relax in front of uninterrupted ocean views. Perfect for diving, snorkeling and fishing, Mackerel Island is a must while in the Onslow area. Comprised of 10 islands in total, these islands are characterized by clear turquoise water and pure white sand beaches, all of which are perfect for swimming or simply relaxing. Known as the oldest settlement between Geraldton and Darwin, this community may be small, but it offers a wealth of history, heritage and adventure. Discover attractions like the old Roebourne Gaol and Harding Dam, along with the gorgeous beaches that are all within a few hours drive. This beautiful park is nestled pleasantly on the banks of the Harding River and offers a family friendly atmosphere that is guaranteed to make you feel welcome. The swimming pool is sure to be a hit, and the thought of heading back to your well-kept campsite at the end of a long day of exploring is sure to bring a smile to your face. Positioned on 200,000 hectares the Millstream-Chichester National Park is a must while in the Roebourne region. The Fortescue River provides the heart of the park and is the life force behind the tropical vegetation and unique wildlife that call this park home. There are five walking tracks throughout the park, with one leading to a permanent fresh-water pool that is ideal for swimming in. This park offers the perfect excuse to discover some of Western Australia�s most beautiful scenery. Travel just a little bit further down the road and you will come to the stunning Munjina Gorge area. Positioned just over 4 kilometres off the Great Northern Highway, this spectacular area boasts incredible scenery and idyllic gorge settings that create the perfect place to set up camp for the night. Munjina is particularly popular for bird watching, so if you are keen to do this, this is definitely the place to do it. Other remarkable highlights of the area include the lovely rivers and creeks, springs, waterfalls, lakes and dams. This is a nature paradise simply begging to be explored. This free campsite will be an ideal resting point for your 4WD, while also providing you with spectacular surrounding views. Nestled right on the edge of the Karijini National Park, you will enjoy panoramic views of the gorge and discover some fantastic 4WD tracks along the way. Since it is less then 100 kilometres up the road a visit to Tom Price will essentially be a must while in this area. Positioned in the Hamersley Ranges, this picturesque town is the highest in Western Australia and is the perfect place to stock up on travel items you may need. Offering some of the best scenery in the state, this is one town you will not want to miss. The Karijini National Park is all about exploring ancient rocky tunnels, plunging gorges, stunning waterfalls and magnificent rock pools. Perfect for those who love adventure, this National Park is spilling over with beautiful and remarkable things to see and do, including Hancock Gorge, Oxer Lookout, Weano Gorge and Mt Bruce. The park will take at least a day and a half to explore, so it�s a good idea to get an early start from Roebourne to ensure you can make the most of it. The best part of the park for 4WDing would have to be the western side, which features highlights like Joffre, Kalimina, Weano, Red, Knox and Hancock Gorges. Formerly known as the Savannah Campground, this lovely retreat offers the perfect opportunity to camp within this beautiful National Park. Facilities include hot showers, BBQ bush kitchens, an alfresco restaurant and open bar. This is an ideal way to experience a little luxury while on your 4WD trip. Positioned within the Dales Gorge area of the Karijini National Park, are three of the area�s most beautiful natural attractions. The Fortescue Falls are stunning after a bit of rain and are perfect for sun baking by. A little further down the road you will come to the Fern Pool, which is undoubtedly one of the prettiest settings in the state. Embark on a three-hour walk and you will come across the Circular Pool, which although is quite a hike, it completely worth it. This town and rock formation of the Pilbara region is primarily known for its hot weather. In fact, according to the Guinness Book of World Records, Marble Bar is the hottest town in Australia. Don�t let this defer you from visiting though, because if you do you are sure to miss out on some pretty awesome sights. Take some time discovering the surrounds of this quaint outback town and you will be introduced to a work of simplicity and beauty. The rock formations around this area are truly stunning and you won�t want to miss the opportunity to capture them with your camera. When it comes to places to stay in Marble Bar, you really can�t go wrong with the Marble Bar Caravan Park. This friendly park offers quiet powered and unpowered sites along with high quality amenities and a close proximity to the town�s facilities. The natural pools surrounding the town of Marble Bar are ideal for swimming, which will be a welcome relief after enduring the hot temperatures here. Chinaman�s and Marble Bar Pool are among the favourites in the area and never fail to disappoint. The drive to them in your 4WD will be an adventure in itself as well. 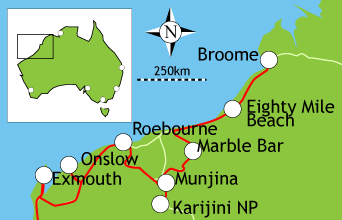 Eighty Mile Beach is one of Western Australia�s most famous and beautiful beaches. Famous as a hot spot for fishing and shell collecting, tourists flock here to experience the best of the west coast. Boasting magnificent sunsets and sunrises, Eighty Mile Beach is all about solitude and has remained one of the most untouched, non-commercialised beaches in Australia. Each year it attracts millions of migratory shorebirds that flock here to take advantage of the rich food supply available to them here. Relax by the water�s edge and discover what it means to be truly at peace. Located right on the beachfront between Port Hedland and Broome, this caravan park is a fantastic place to base yourself for exploration of this glorious seaside destination. The park itself offers clean and modern facilities, including camp kitchens, a well stocked mini-mart, free gas BBQs, a TV room and laundries. During the cooler months, fishing on Eighty Mile Beach produces blue nosed and threadfin salmon. Since it�s such a popular spot for this hobby, there are usually people fishing every 10 metres or so, so get in early to claim s good spot. 4WDing is also popular on the beach, so come prepared for some sand driving.